You have heard the stories now it is time to find out for yourself, check out listing of Nashville's Best Haunted Ghost Stories in Nashville and Middle Tennessee. You might want to bring a friend to share the scare. Our listings are updated every fall with best scary attractions for the Halloween and Fall nights. 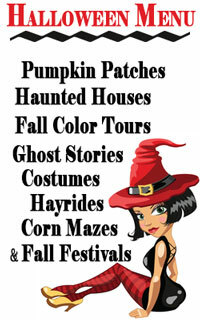 Make your plans and bring a friend to enjoy Scareville Tennessee! Enjoy the Haunted Life with Nashville Life! Below is a complete list of Nashville and middle Tennessee Ghost Tours. Trips are available Thursday, Friday and Saturday nights from September 27th – November 10th, 2018. Trips run each hour from 6:00 pm – 10:00 pm. Reservations must be made and paid in advance! Each fall Sam Davis Home Ghost Tours storytelling event gives visitors a chance to hear a different tour of the historic house and property. Do you believe in ghosts? Do you get a thrill from hearing about paranormal activity? If so, The Hermitage Ghost Tours are for you! Each year in October the Haunted TN State Museum opens it doors to kids and families to share ghost stories from Tennessee's haunted history. This tour covers about six city blocks. Wear comfortable walking shoes and dress for the weather. Most of this tour is wheelchair accessible. Come experience our special 90-minute Hermitage Ghost Tours! Follow your guide on an exciting adventure as they take you on a ghostly voyage into The Hermitage mansion, the First Hermitage cabin and to Jackson’s tomb. Opened in 1822, the City Cemetery is the oldest continuously operated public cemetery in Nashville. The Nashville City Cemetery in an outstanding outdoor museum focusing on the history of Middle Tennessee. The ORIGINAL walking, storytelling tour of downtown Murfreesboro. Join storytellers as they tell the tales of haunted happenings, eccentric characters and true crime. Tours start at 7pm and the last one heads out at 9pm.